Believe it or not, one of the most effective skin remedies is washing with the coffee grinds you discard after brewing your morning coffee. This little known secret is helpful for men and women alike — to keep skin looking silky, smooth, and blemish free. Coffee grinds brighten skin, prevent clogged pores, and soften lines. Sound like I’m advertising an expensive face cream? Coffee has been used for thousands of years to moisturize dry skin, heal cuts and abrasions, and soothe chapped hands and feet. The grounds contain oils that moisturize your skin. There are over 300 naturally occurring antioxidants in the ground up beans to protect your skin. In fact, half a cup of the very same grinds we usually discard contains as much antioxidant power as three oranges. What's more, this little known beauty remedy whisks toxins out of your skin. Because it has the same pH balance as your skin, it’s a powerful ally in battling acne and banishing blemishes. Your skin loves coffee! Any coffee grinds will do. Why throw away the valuable grinds after you've enjoyed your morning brew? I empty the used decaf K cups from my Keurig coffee maker into a small bowl and keep it next to the shower. Washing my face and body with the grinds is a little messy but so worth it! Where can you find a natural astringent, antioxidant, detoxifier and exfoliator all rolled into one? My research tells me this beauty grind makes spots fade, smooths wrinkles, heals dry skin, and stimulates circulation. USE IT AS A SCRUB Coffee grounds slough off dead cells and stimulate circulation in the skin all the way down to the cellular level. They’re a whole lot easier on your skin than harsh, salt-based facial scrubs you find in the store. Use it on your face, your elbows, the soles of your feet, or any place you want silky soft skin. USE IT FOR MASSAGE Want to smooth away the appearance of cellulite? Studies show that massaging coffee grounds into the skin helps eliminate bumps and dimples. The caffeine constricts blood vessels so skin appears tighter, firmer, and smoother. Next time you brew your morning coffee, don’t toss the grinds. Save them until you’re ready to give yourself a better-than-spa experience. Once a week it's easy to wet your skin in the shower, scoop up a tablespoon of the grounds, and using a gentle circular motion, apply them to your face and body. Rinse with water to reveal fresh healthy skin. It’s not about recycling, although that's a bonus. It’s not about saving money, although I like that benefit too. It’s not a crazy unproven idea — just a well-kept secret. 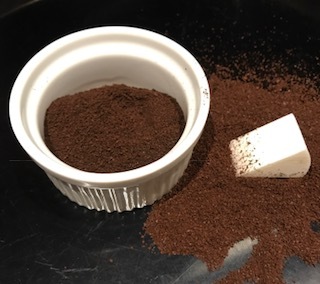 Reuse your coffee grounds and resist the sales pitch for expensive creams. There’s nothing to lose and your skin will thank you.